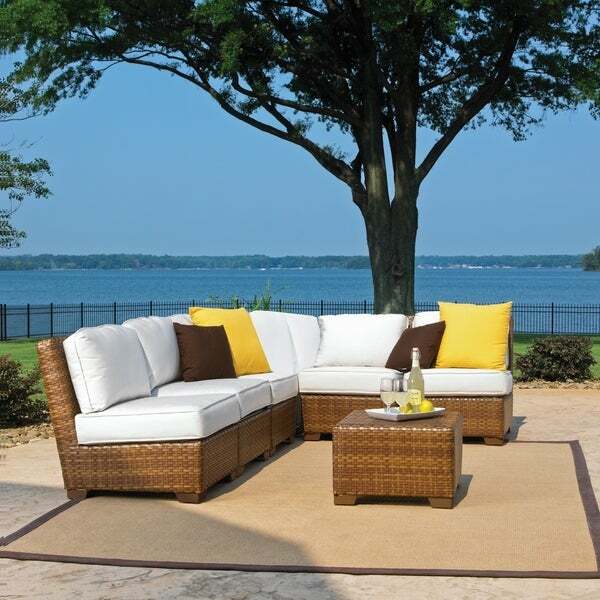 The St Barths collection by Panama Jack incorporates an extruded aluminum frame with an exclusive thick woven wicker fiber from Viro. The St. Barths side chair, arm chair, and chaise lounges are all stackable for easy storage. The occasional tables, dining tables and pub tables, have a Plexiglas material underneath the woven surface eliminating the need of a glass top. The armless chair, Corner chairs, coffee table, and ottoman allow for a variety of set ups from modular sectional to sofa or loveseat. Assembly required. This product ships in four (4) boxes. "Height of seat from floor and height of cushions?" "what are the overall dimensions of this sectional, in the configuration shown?" Hello angief1, The dimensions include are as follows: Armless: 30 inches high x 24 inches long x 30 inches wide, Corner: 30 inches high x 32 inches long x 32 inches wide, Coffee Table: 15 inches high x 21.5 inches long x 21.5 inches wide. Have a great day!